Upright, spreading shrub; stems 0.5-3 m tall, young stems minutely hairy. Alternate, evergreen, leathery, in "horizontal" rows on stems, egg- to narrowly egg-shaped, 2-5 cm long, tips pointed, bright glossy green on the upper surfaces, paler beneath, margins thickened and sharply toothed. In 3- to 10-flowered axillary clusters; corollas bright pinkish, narrowly bell-shaped, about 7.5 mm long, the lobes short, spreading, and triangular; calyx lobes red, triangular; filaments densely hairy; anthers with long, straight tubes above the pollen sacs, not awned. Berries, globe-shaped, 4-7 mm wide, deep purplish-black with bloom, or blackish and shining; sweet and edible, but musky flavour. Dry to moist, open forests in the lowland and montane zones; frequent in SW BC, rare near Prince Rupert; S to S CA. A shade-intolerant, submontane to montane, Pacific North American evergreen shrub. Occurs in hypermaritime to maritime summer-wet cool mesothermal climates on moderately dry to fresh, nitrogen-poor soils; its occurrence decreases with increasing elevation and increases with increasing precipitation. 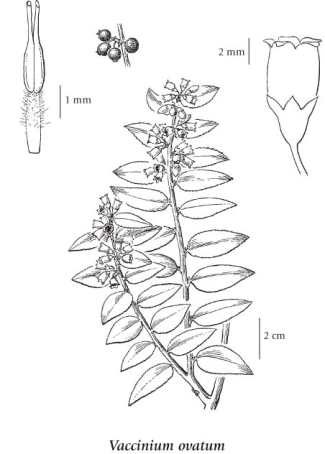 Vaccinium ovatum var. saporosum Jeps.